Learner’s Edge® / 90 caps - Nature's Way®. Take 3 capsules daily with food, or as recommended by your healthcare professional. For best results, take in 2 or 3 divided doses. If desired, capsules may be opened and contents mixed into cold food. 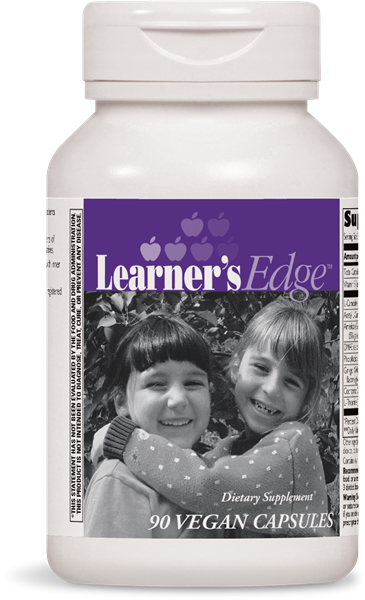 Learner's Edge® is a registered trademark of Creations Own, Inc., which is licensed for use to the International Child Development Resource Center (ICDRC) and Integrative Therapeutics, LLC. At what age can Learner's Edge® be taken? Are any ingredients in Learner's Edge® derived from nuts? Do not take this product if you have epilepsy or a history of seizure disorder. Do not use without the supervision of a healthcare professional if you are taking Warfarin or any blood thinning drugs. If pregnant, nursing or taking prescription drugs, consult your healthcare professional prior to use.